It took me an hour, and I had all the materials at home, but they are really easy to find (...mostly Hema). What you need is: felt, velcro, stapler, scissors. 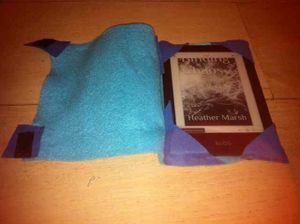 Cut felt to measure: size of E-Book reader + 1cm extra on every side. ... but that was too little so I added 3rd staple. // Cut the "triangles" off. Now, add one of the inner corners. Staple on the narrow side of "reader". Then fold the cover, and staple from the OUTSIDE of the wide side of the "reader". Try if the reader fits in, and adjust by stapling extra here-and-there. For the "closing" mechanism: cut the ribbons, and staple them to the end of "flap". Cut velcro in pieces that fit the width of ribbons. Staple velcro to the "bottom" of the cover. Next, staple velcro to the ribbon. Cut the excess of ribbon. Add some extra staples, to make velcro more attached to the ribbon. This is how it looks finished, from the outside! This is the final look, when open. This page was last edited on 21 December 2013, at 00:31.